Today, Say Something Sunday, the Fat Activism Conference, and my birthday are all on the same day and if that’s not a confluence of events for fabulous fat activism I don’t know what is! “Say Something Sunday,” is a day dedicated, at least on this blog, to personal Size Diversity activism. To be very clear, nobody is obligated to do activism so if this doesn’t appeal to you that’s totally cool, I’ll be back tomorrow with your regularly scheduled blog post! It’s “Say Something Sunday,” a day dedicated, at least on this blog, to personal Size Diversity activism. To be very clear, nobody is obligated to do activism so if this doesn’t appeal to you that’s totally cool, I’ll be back tomorrow with your regularly scheduled blog post! Happy Birthday! (You share a birthday with my late mother) And thank you so much for all you have done to inspire me to be happy and content in the body I live in. It is HARD to commit to no negative body talk. I’ll try! Happy Birthday Ragen, Thank you for an excellent Fat Activism Conference. The few problems I may have had with technology are insignificant to what I have gained from the experience. Awesome! Happy Birthday, Ragen!! You’re an amazing woman and I’m so happy that we’re blessed to have you posting and bringing so much sanity to our often insane world. Happy birthday, Ragen! Many happy returns! I didn’t say anything today (or yesterday), but I did say something recently. At the pharmacy, while waiting for my prescription, I noticed the front cover of a magazine, that had a picture of some sickeningly-sweet treats on it. Seriously, I got queasy looking at all that sugar packed into one package. I love caramel apples, but caramel apples with candy on them? Bleh. Too much. “But, that’s what diabetes IS!” she said. “Oh, no. It’s much more nuanced than that. The biggest danger for a diabetic is having LOW blood sugar, hypo-glycemia, and slipping into a diabetic coma and dying.” This is true. High blood sugar will damage you, in the long term, with a years-long slow stress on the organs, but low blood sugar can kill you RIGHT NOW, and diabetics have both high AND low. It’s not that their blood sugar is always too high. It’s that their blood sugar level is uncontrolled that does the most damage to the body. A diabetic with their blood sugar under control has a good mid-range level, not a low level. We NEED sugar, from time to time, to save our very lives. Too much at once, though, and we go hyper-glycemic, and get sick. Not just “Oh, I ate too much candy” sick, but possibly needing to go to the hospital for treatment sick, if it’s high enough. Even someone who does not regularly get insulin injections may need an emergency insulin treatment, if they get too hyper-glycemic (like 500 or 600 sugar count – I’ve heard of such episodes, but never witnessed one). But that’s not nearly as common as hypo-glycemic emergencies. I’ve witnessed a LOT of those, and they are scary. I didn’t get to say all that. Nothing past the “diabetic coma and dying” part, really, because my order was ready at that point. Still, I put that much out there, and I saw a couple of people in the pharmacy looking my way and paying attention! 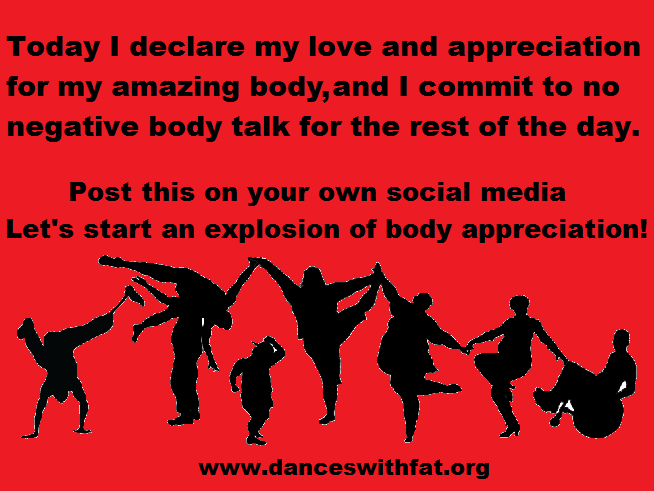 It’s not about fat, per se, but it touches on it, thanks to shared pre-conceptions and stigmas. A year ago, I wouldn’t have gone there, at all, in public. Thanks to your encouragement to “Say Something,” I spoke up. You have a big influence on a lot of people, Ragen, in more ways than one. Sounds like a good basis for a Weird Al Yankovic parody song. (Same album has a parody of All About the Benjamins, too, funnily enough. “All About the Pentiums.”). My dad was recently in the hospital with a horrid infection, that the docs initially thought would kill him. He’s ok now, and back home. But the night we called the ambulance he sugar was 20 mmol (I think 250-300 on the mg/dl scale). A normal reading is 5-7. And the insulin wasn’t working, so we thought the hospital has more stuff that they could help him with. And yes, hyperglycemia damages but it takes years for it to accumulate. Hypoglycemia kills far more, and RIGHT NOW. I’m glad he’s better! Yeah, that’s pretty rare. Also forgot to mention that it’s scary that this pharmacist doesn’t know what diabetes is! Most ppl out there (and sadly medical professionals) think diabetes is: high blood sugar, and “eat too much”. I’ve read a theory that said IR is a compensatory measure against frequent low sugar levels (aka dieting) since the sugars must be a minimum level to prevent ill-health, and the IR is the body’s natural way of doing this. I think it was on JunkFoodScience blog. So, dieting causes diabetes? HAHAHAHAHAAAAAA! Actually, this was the person manning the cash register at the pharmacy, but IN the pharmacy, not the front of the drug store. I’m not sure if she’s actually medically trained in any way, at all, or if she just knows the drug names, and how to work a register. I hope she just knows the drug names and how to work a register.